So, you got a short cut in hopes that it would be a low-maintenance do. Some short cuts actually require more morning styling time if it's unlayered and straight. If you're looking for a low-maintenance short cut, the messy layered bob is the way to go. It's fun, sassy, versatile and easier to style than more formal, structured looks. To style a layered, messy, short bob, the goal is to keep the movement in the hair so that it does not lie flat. Apply a small dollop of mousse to towel-dried hair. 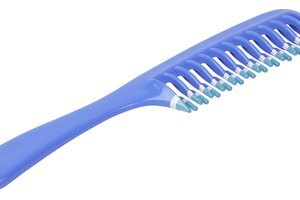 Start at the roots and comb the mousse through the hair using a wide-tooth comb. Blow-dry the hair while scrunching sections of it with your hands. Continue until hair is completely dry. Put a small amount of texture cream in the palms of your hands. Rub them together. Use your fingers to run the cream through the layers and the ends of the hair. This will help them flip up a bit and give your hair a messy voluminous look. Use a curling iron to curl the ends of the hair and the layers throughout the hair, When curling the layers and the hair, do so in different directions so that it does not look too styled. Mist the hair lightly with hairspray. Tousle with your fingers and it's done. Do not comb or brush the hair when it is dry. If you must detangle it, use your fingers.